If you are someone who is not into wearing make-up and/or have never have never spent much time practicing or applying it, getting make-up right can be difficult. Permanent eyeliner stays put without smudging or the need to reapply – a major bonus if you work long days and want to remain looking good with very little effort. 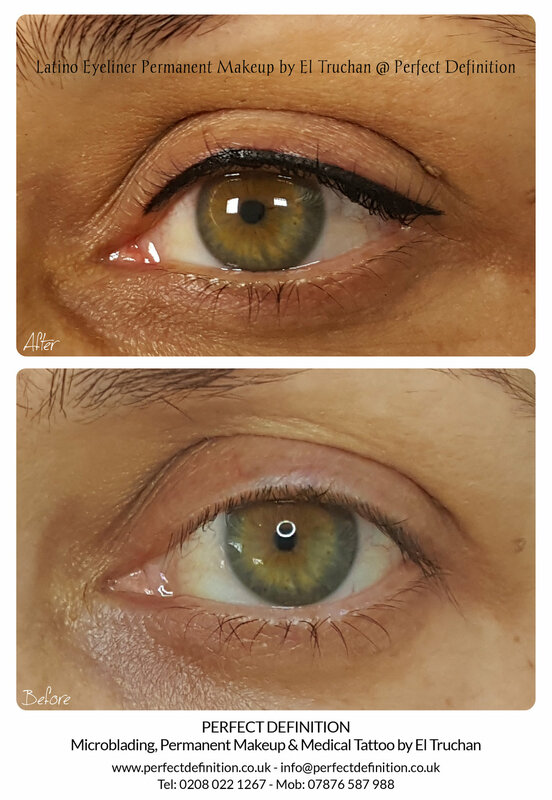 The mere mention of permanent eyeliner may conjure up an image of a fake, overly made-up look, but if it’s applied by a good practitioner with a ‘less is more’ ethos then it is amazing – and a huge time saver. It’s a fantastic alternative for those with sensitive eyes who find it uncomfortable to wear mascara and eyeliner, or who find it hard to apply eye make-up due to unsteady hands, poor eyesight or other health issues. It is also brilliant if you swim or exercise regularly before work or in your lunch hour. I am not really much of a make up wearer, unless I am at work, or going ‘out out’. I’m just lazy really, and even at my most made up, it’s a bit of eyeliner, mascara and concealer for the dark circles under my eyes. When i’m at home, or just hanging out with friends I wear none. But I know the difference even a little make up can make, so after researching permanent make up for my book, and meeting El Truchan, last summer I decided to take the plunge and get a liner done on my top lid. And I am SO pleased with the results. I look like i’ve got that bit of make up on that makes me look nicer, but i’ve done nothing. Result! Do your research. Finding a professional permanent make-up artist whose work you admire and talent you trust is essential for booking this process – they are tattooing your face after all! In my opinion, this is definitely not the time for a heavily discounted opportunities, unrated or newly qualified technicians, as you will have to live with the results every time you look in the mirror - for a few years. Read reviews, check out their galleries and make sure you are 100% confident in their ability. El was very thorough in her explanation of the procedure and of all that would be expected of me and how it would heal. She drew the line on my eyelids in pen to confirm the shape and thickness of the permanent line, and make sure they were even. Does it hurt? Well, it’s like being at the dentist - a bit uncomfortable, but it doesn’t hurt at all. The numbing cream really does help and you do get used to the scratchy feeling after a while. My eyes were a little puffy and I found it sore the following 24-48 hours, and a bit itchy and slightly irritating when it started to scab over in the days following the procedure, but it’s totally bearable. You cannot wear any make up on the eyes for around 1-2 weeks after. This wasn’t an issue for me as that is not that unusual, but for someone who usually wears it I would advise having it done when you have a quieter time and no important events going on. You also cannot get the area wet, so remember not to book it in just before a holiday or when you will be swimming. I am thrilled with the result, and these are the before and after pictures above. The line was very dark and a bit wobbly looking, due to puffiness, to start with. Then as it healed and a scab formed, the colour receded for a few weeks. Now, a few months later, it has come back as a dark smooth line, and is just right. Basically, I just look like i’ve got a bit of make up on, as my eyes are more defined, and look better for it. My face looks more awake and I look ‘made up’ on the days when perhaps I wouldn’t. It’s a time saver on work days, (in both apply, reapplying and removing), as now I just apply mascara and concealer. Lizzie Edwards is the owner of Lizzie Edwards Style Consultancy, and one of London’s leading Personal Stylists and Image Consultants for Women in business.